Wether you have just ordered a fiberglass hull or model, or are looking at your new project, there are some important first steps before you begin working on it. Building a ship model is a considerable effort in time and money, so it is worthwhile to do adequate research to make sure that your miniature is a fair representation of the prototype. Luckily, there has been an explosion of warship information over the last 25 years. Plans, books and photos exist for many types of vessels, even relatively esoteric types. Of course, the more popular or well know the prototype, the easier your research task will be; the Missouri or Bismarck has a lot more information available than Danube river monitors. But, this is all part of the challenge. The first thing you will need is a good set of plans. If you are just starting out, you are probably better off getting a set from a reliable source, instead of attempting to draw your own. In our Links section, you will find some suppliers for plans. Most kits and some hull makers include plans of varying degrees of completeness with their products - you should check with them to see what other material would be needed for the project. The best plans are those from official sources, but be aware that even these will only represent a certain period of time. Ships, especially warships are dynamic structures, and are modified all the time. Significant variations will often be present within classes of ships - for example, the Fletcher class of US destroyers had many variants - round bridge, square bridge, even a few that had catapults to launch aircraft! Determining both which ship to model, and the timeframe you wish to represent is critical in the early stages of planning. Plans drawn up by model makers will vary in quality and accuracy as you might expect. One important thing to note is that quality of draftsmanship does not equal quality of accuracy. I have seen some beautiful plans from Germany that were inaccurate, and rather crudely drawn sketches that were correct. ALWAYS check your sources, and cross check them against photos. 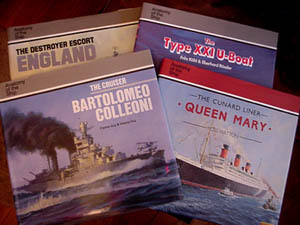 Again, we are very fortunate that reference books exist for many types of warships. Often labors of love, these represent countless hours of effort by the authors. You are indeed fortunate if your prototype is covered by the Anatomy of the Ship series, as these are perhaps the ideal resource for modelers. 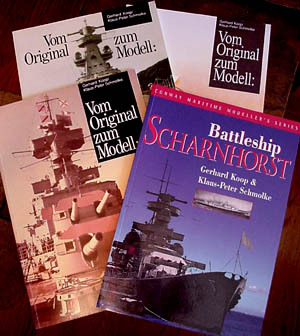 Another great series originated in Germany, the Vom Orignal sum Modell Series, which covers units of the German Navy, in both World War I and II. A subject dear to my heart, since I own SeaPhoto! Of course, my service is just one of many great ways to get photos of the subject you are modeling. Most Navies and crews are proud of their vessels - this can be a big help once you explain what you need. Bring some shots of completed models with you to let them know what you are doing. Then take some more! Photograph everything on the outside of the ship, from as many different angles as possible. For a destroyer sized ship, I will often shoot 6 to 10 rolls of film initially, and even then will find areas that I missed. If you have a decent digital camera, set it on automatic and go crazy. For ship documentation, the basic settings are usually fine. Be sure to select the highest resolution or largest .jpg file size - you won't regret taking big photos as long as you have enough memory. Still have a film camera? Use a 200 speed film on most days. If you anticipate the need for enlargements, 100 speed film or slower shot with the use of a tripod can give crisp 8 X 10's - very handy for mosaic views shot from pierside. Walk at a set distance parallel to the ship's centerline and shoot overlapping shots. These will be very useful later. Overcast days are great to shoot details, as they reduce harsh shadows. Try and find alternate views points to shoot from - an adjacent ship can be a great vantage point, as are reviewing stands, buildings, the next pier, etc. A telephoto lens can help a lot here. There are a few services that offer photos for the ship modeler. If you hear of more, please let me know. SeaPhoto - my service, covering modern warships, and most of the museum warships in the US and Canada, as well as a couple in England. The Floating Drydock - another great resource, has great views of World War II era ships, as well as some more modern subjects. They have a lot of shots taken at Mare Island during the war - some of the most useful views of US Warships that exist today. Vital for the US World War II modeler. Sells photos of US Navy warships taken during World War II - not quite as nice as Floating Drydock, but may have views that they do not. Worth checking their catalog. Navsource - great archive of photos for the US Navy. US Navy Digital Images Archives - source for online imagery direct from the US Navy. Please email your suggestions to me here. Thank you!